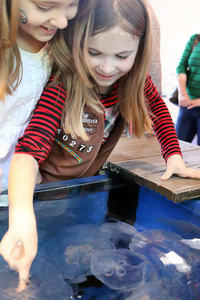 Girl and Boy Scouts should troop down to The Maritime Aquarium at Norwalk on Sat., March 23 to take advantage of admission discounts and special workshops as the South Norwalk attraction celebrates its annual Scout Day. Any Girl Scout or Boy Scout wearing her or his uniform to The Maritime Aquarium on March 23 receives a discounted price: $16 for children ages 3-12; $20 for adults; and $18 seniors 65+. This discount applies to Scouts of all levels, even adult Scout leaders. For Scouts, those are thrifty savings off the regular ticket prices of $17.95 for children, $24.95 for adults, and $22.95 for seniors. Besides close encounters with sharks, seals, sea turtles and other marine animals, Aquarium admission includes an IMAX® movie showing on the six-story screen, the largest in Connecticut. Films and times on March 23 are: “Oceans: Our Blue Planet” at 10 a.m. and 1 & 3 p.m.; “Pandas” at noon; and the new “Superpower Dogs” at 11 a.m. and 2 & 4 p.m..
Plus on March 23, a selection of special workshops are available to Scouts. They range from the one-hour “Life Between the Tides” for Scouts in Grades 2-3 to a nearly three-hour “Animal Habitats Junior Girl Scout Badge” workshop for Grades 4-5. Costs vary from $5 to $18 for the classroom workshops. Advance registration for any workshop is required. Several merit-badge programs, a Scout cruise aboard the Aquarium’s research vessel and a Scout sleepover on March 23 already are full. For more information about Scout Day, to purchase discounted tickets and to register for workshops, go to www.maritimeaquarium.org/scout-day.